Following is the talk I gave to the Take Back the American Dream conference panel that I moderated,Making It In America: Reviving and Strengthening U.S. Manufacturing. Also on the panel were Rep. John Garamendi, (D-CA); Yvette Pena Lopes, Director of Legislation and Intergovernmental Affairs at Blue Green Alliance and Scott Boos, deputy director of the Alliance for American Manufacturing. You have undoubtedly heard the numbers, almost all of them bad. We have a trade deficit of more than $550 billion dollars a year. This is actually an improvement from before the financial collapse, but only because people's buying power remains down. On this chart, that first line down is $100 billion. Each line down is another $100 billion. Each year. This is real money that bleeds out of our economy. If we were engaged in actual "trade" the money would be coming back as fast as it is leaving -- that is what the word "trade" means. And that would be a win-win for all trade partners. But it has not worked out that way. Imports stay ahead of exports. Our manufacturing sector has been bleeding out of our country along with the money. The lure of low prices, fueled by currency manipulation and subsidies, combined with the ability to treat workers in ways they cannot be treated here where people have a say, has led businesses to close factories here and open them over there. Eventually, entire industries vanish. This problem of the loss of manufacturing -- and its jobs and factories and industries -- has been building for decades but in the Bush years it reached a crescendo. We lost 54,000-plus factories, and 1/3 of all of our manufacturing jobs. Our country has allowed key industries, key supply chains and key national skills to erode or vanish. And along with those we allowed communities and entire regions to decline. And worse than just decline -- how many of you have seen Detroit with your own eyes? We have lost hard-won capacity that will take enormous investment to get back. We lost a large part of our ability to make a living in this world. And now we are feeling the consequences of these losses. This is because manufacturing is different. Manufacturing doesn't exist in isolation; it requires a manufacturing ecosystem, or commons, to properly function. This is where manufacturers, suppliers, designers, innovators, educators and all the other manufacturers, suppliers, designers, innovators and educators all complement each other, creating a synergistic "cluster" effect. This is why they say that a manufacturing job supports so many other jobs. Manufacturing in particular supports communities surrounding the factories. This is why closing a factory loses so many jobs and affects entire communities. This is why so many of our country's once-strong manufacturing areas now look the way they do. I would like to present an overview of the key policies ideas for reviving American manufacturing. First, of course, is the trade problem. 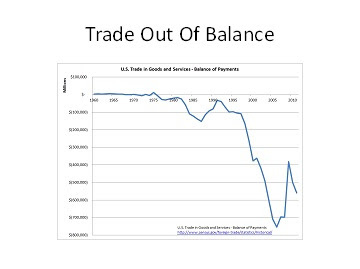 We have to find ways to BALANCE trade. This starts with CURRENCY. China manipulates its currency, keeping it low so the price of things made there stays a lot lower than the price of things made elsewhere. So out of the gate they start with this competitive advantage.